This morning I picked one last San Marzano before yanking my spent tomato plants from the garden. It was a beautiful overcast day with the temp in SoCal finally dipping to a reasonable 75 degrees. I basked in the raindrop I thought I felt while standing outside coated in sunscreen. This year I was blessed with some excellent tomato harvests. When I left for my Italy vacation in May, the little tomato plants I had stuck in the ground in March were just starting to get big. Many already had fruit on the verge of ripening. The thought of being away from them for 16 days was dispiriting. I was comforted only by the prospect of traipsing through Tuscany clothed in something cute and mildly practical, sipping local wines, and taking in the astounding scenery alongside my beloved. 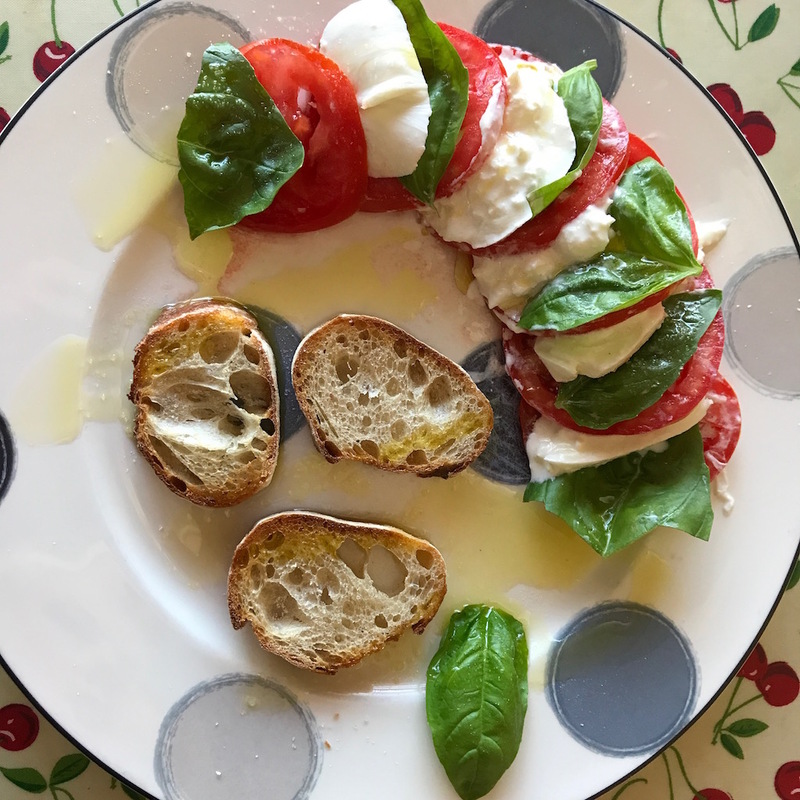 Fortunately, there are tomatoes in Italy, too. There is also a fair amount of cheese. And I did my best to consume more than my fair share. In addition to it’s own specialness, cheese goes really well with tomatoes. 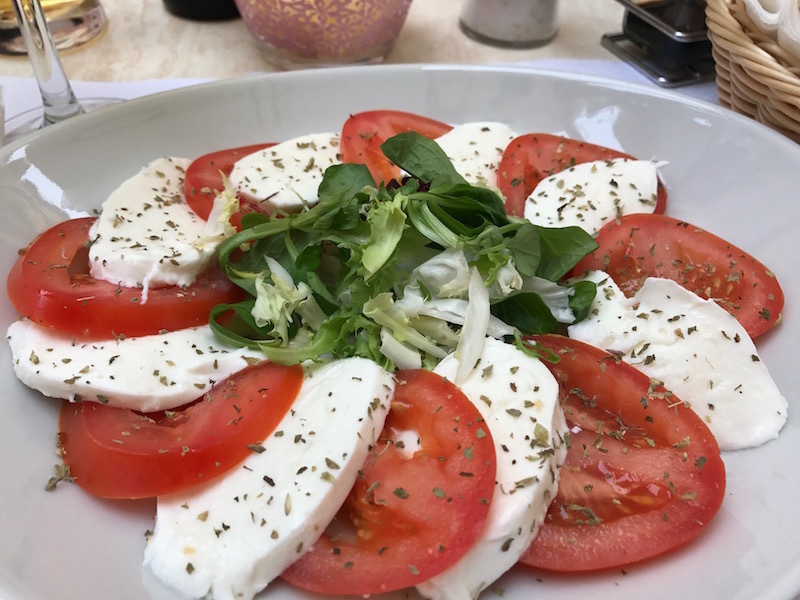 I ate a caprese salad most days. 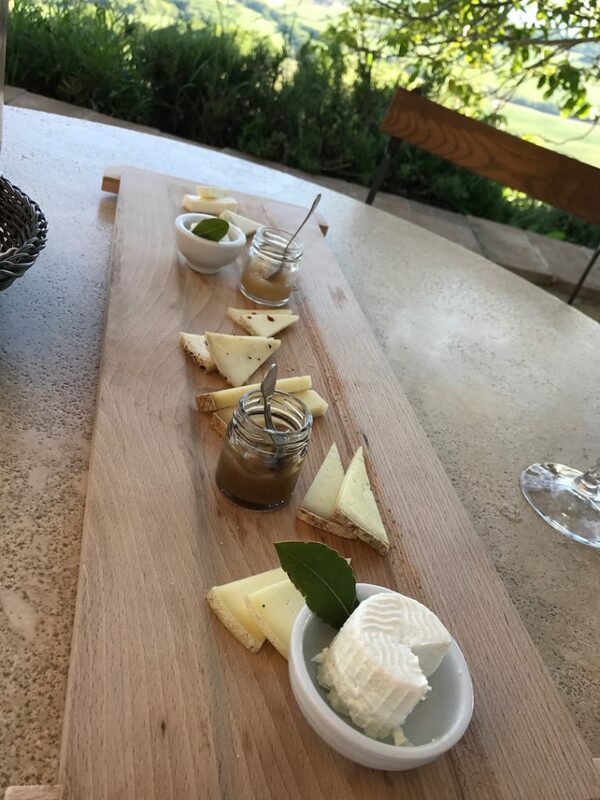 The Husband and I toured an artisan farm where cheese is made, met a baby lamb, and ate our way through a delightful tray of beautifully presented cheeses while seated above the stunning Val d’Orcia. There was cheese in shops, cheese in restaurants, cheese on The Husband’s pizzas (which he ate most days). Departing Tuscany and the family operated agriturismo we’d made our home base for a week had me teary. It was like leaving summer camp, brushing P.J., the horse I kinda learned to ride, and swearing to everyone I’d met that we’d be friends forever! xo! This time around I just waved, climbed into the passenger side of our crazy-gas-efficient rental car*, and drove off between the Italian Cypress with a can of EVOO. Back here in LA, I can get some really tasty buffalo mozzarella at my local cheese shop. There is no judgment about how much cheese I want when shopping there. Whoever said an ounce of cheese is a serving has a sick sense of humor. At the cheese shop I am encouraged to take as much cheese as I’d like. In fact, after wrapping up my cheeses the cheesemonger inevitably asks if I’d like anything else. I rest my case. Like I said, my garden really gave it up this summer. I enjoyed many capreses at home assembled with sliced beefsteaks and early girls. And I froze a couple bags of those San Marzanos. We’ll see how they pan out when sauced later in the tomato-barren winter. *Driving the ever winding hillsides of Tuscany is pretty chill. The autostrade is a different story. And I advise against driving in Florence. Ever. David isn't going anywhere. Just walk. 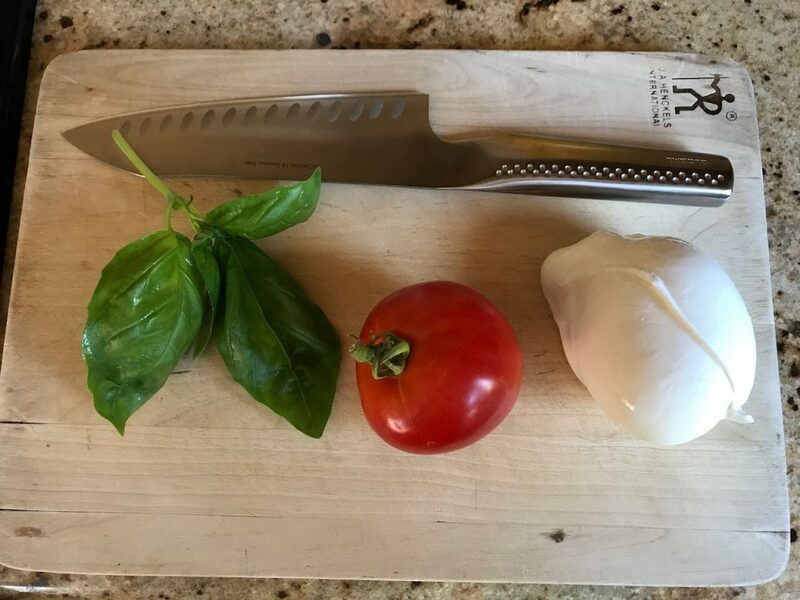 Wonderful description and beautiful pictures of one of my very favorite foods on the planet, tomato. You nailed several of my favorite things in life: traveling, eating farm to table foods and drinking wine’s directly from the region being visited. Canal to enjoy many of my favorite things in life: being directly on a salt water beach with a mega supply of tasty oysters, along with a small yard to attend as well has a nice area to grow some of my favorite things, tomatoes, basil, oregano along with several other herbs. The only thing missing is the cheese and that’s available nearby. I am grateful that these are a part of my life. We have a lot to be grateful for.